A panel featuring the West Door of Southwell Minster was included in the plaque presented to the new Bishop during his enthronement, and this was made by two of our fourth year pupils, Ginette Unwin and Ben Huson. Our after school clubs and societies have quickly got back into full swing after the summer break. The Computer Club, led by Mr D White, has recently produced a school magazine, and its popularity can be judged by the fact that we sold out of copies after 48 hours! The 4th year girls netball team recently competed in the Newark and District Schools Tournament, which was ultimately won by Chuter Ede. The girls - Susie Marshallsay, Anna Corner, Rachel Tucker, Joanne Harnsworth, Katya Allison, Alison Latham, Clare Pearson and Sarah Catley competed well and were a credit to the school. On the same day - Saturday October 15th - three teams of boys competed in the Newark and District Schools 6-a-side Soccer Competition. All the boys performed creditably and the B team of Alistair Baird, Jonathan Lovell, Martin Johnson, Alex Sissons, Nicholas Struggles and Michael Zdanowski, reached the semi-final stage before being knocked out by Highfields School. However, our 'A' team progressed to the final and they then succeeded in beating Highfields 3-1. The boys representing the school, led by captain Matthew Russell, were Richard Woodhouse, Sam Cawley, Anthony Newton, Damian Clough and Jac Jones. This year the school also has two teams playing in the Newark and District Primary Schools Soccer League. In the final week of last half-term we were pleased to welcome Mr John Davis, of Southwell Rotary Club, to our school assembly. He was presented by Mr Bowler with a cheque for £95 towards Haemophilia and Leukemia Research. This money was raised by the pupils last summer during a sponsored sunflower seed growing competition. 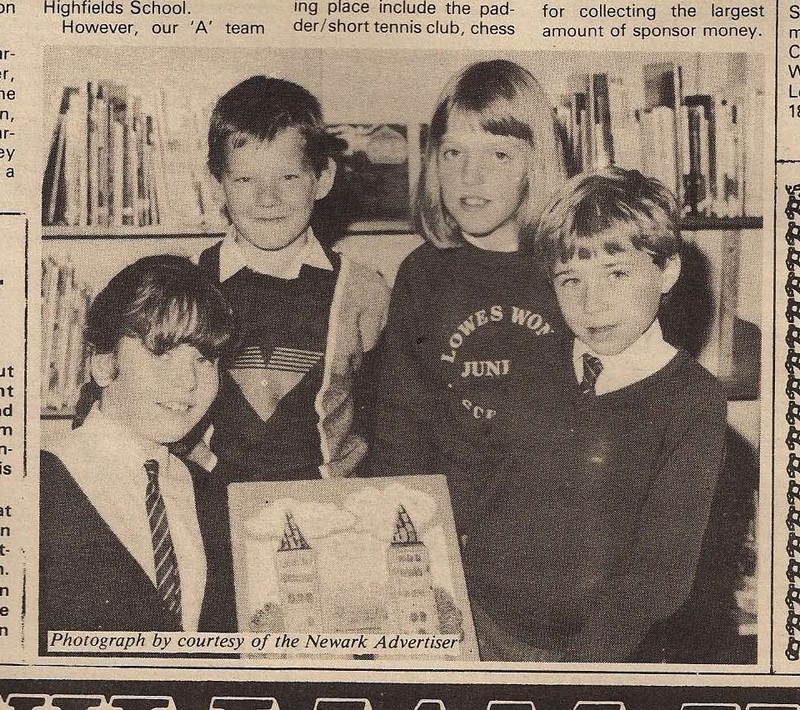 He in turn, presented prizes to Naomi Rodgers and Laura Dickinson for the tallest growth, and to Ben Huson and John Robson for collecting the largest amount of sponsor money.